Home » Politics » Nihalani is 'proud to be PM's chamcha'. But are BJP CMs far behind? Nihalani is 'proud to be PM's chamcha'. But are BJP CMs far behind? Censor chief Nihalani admits he's proud to be PM Modi's chamcha. Will BJP CMs also confess now? PM Modi's address to the US Congress drew over-the-top praise from BJP CMs. Are they his chamchas? Two BJP CMs were conspicuous by their absence in this chorus of praise - who were they? Which Union minister went ga-ga, with six tweets on the speech? This week saw a strange synergy between two entirely unrelated events - the Bollywood movie Udta Punjab's run-in with the Central Board of Film Certification, colloquially known as the Censor Board, and Prime Minister Narendra Modi's five-nation tour. The day the controversy over the Censor Board's unbelievable list of 89 cuts in the movie broke out, #UdtaPunjab started trending on Twitter. Along with it, another hashtag that soon started trending was #UdtaPM, a dig at Modi's frequent travels abroad. As the week progressed, makers of Udta Punjab and many others in the Hindi film industry decided to take Censor Board chief Pahlaj Nihalani head-on. They alleged his decision was motivated by politics and called him a 'chamcha' (stooge) of Modi. While the PM hopped from one continent to the next, Nihalani decided to accept the tag once and for all, and declared that he was indeed the PM's stooge. He even ventured to enquire what was wrong with that, asking if he was supposed to become the Italian PM's stooge instead. While nobody has challenged what seems to be Nihalani's strong belief that it is compulsory to be somebody's chamcha in life, he does deserve a pat on his back for proudly owning up to what many others are doing without confessing. As Modi's address to the US Congress hit our television screens on Wednesday evening, an array of BJP leaders took to Twitter to laud the PM and his speech. They really were at their sycophantic best on 8 June. Interestingly, these tweets were mostly from Chief Ministers of BJP-ruled states. 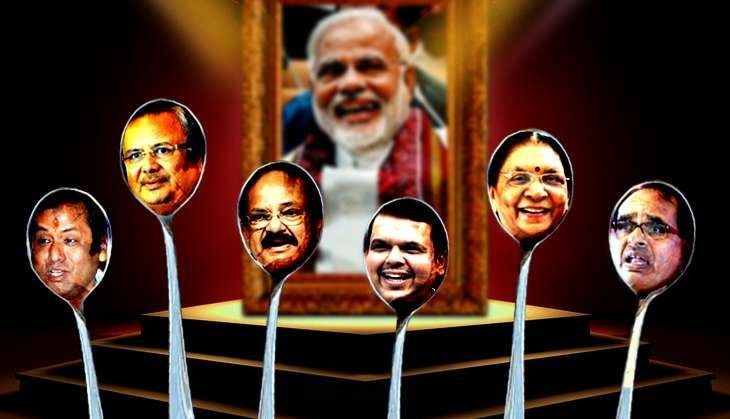 National BJP leaders and Union ministers in Modi's cabinet have been known to sing his paeans earlier, but this time, for some unknown reason, most of them kept away. Take a look at members of this elite fan club and their statements. The Chhattisgarh CM was at the front of the queue. Showering the most eloquent praises on the PM, Singh likened the speech to Swami Vivekananda's address to the Parliament of World Religions in Chicago in 1893. Hon. PM @narendramodi Ji's US visit has given a big boost to INDO-US bilateral relations. The Maharashtra CM felt that Modi's speech received 'uncountable' applause and it proved that the latter was a 'world-leader'. The Madhya Pradesh CM sent out at least four tweets, calling the speech 'brilliant' as well as 'excellent'. Through brilliant speech in US Congress, PM @narendramodi ji has conveyed the sentiments of 1.25 billion Indians in most impressive manner. As extraordinary global leader, PM @narendramodi has rightly described India-US ties stretch from depths of oceans to vastness of space. In his speech mixed with wits, PM @narendramodi touched upon every possible aspect from history to politics & other relevant issues. PM @narendramodi's excellent speech in the #USCongress actually symbolizes the growing confidence of a transforming country & its people. The newly-elected Assam CM was content with the fact that the speech received a standing ovation and appeared pretty sure that it 'mesmerised' the US Congress. PM Shri @NarendraModi mesmerizes US Congress with his speech on Humanity. Modiji’s speech will give a new dimension to Indo-US relationship. The Gujarat CM, who is looking after Modi's home turf, felt the address was already 'historic'. Historic address to US Congress that reflected 'ambitious' India's rise makes every Indian proud. Thank You Prime Minister @narendramodi! PM @narendramodi's address on India's strengths, responsibilities & issues faced by world will go long way in deepening India-US ties. The Haryana CM agreed with his counterpart in Madhya Pradesh that it was indeed an excellent speech. The Jharkhand CM tweeted his complements in Hindi, saying it was a fantastic speech and it was a moment of pride for all Indians. Since it was an all CM line-up, some BJP CMs were conspicuous by the absence of any statements from them. These included Vasundhara Raje in Rajasthan and Laxmikant Parsekar in Goa. Top Union ministers too abstained, including Home Minister Rajnath Singh, External Affairs Minister Sushma Swaraj, Finance Minister Arun Jaitley, Defence Minister Manohar Parrikar and HRD Minister Smriti Irani. Party chief Amit Shah also did not tweet any such complements. Urban Development Minister Venkaiah Naidu is well known for calling Modi 'God's gift for India' and 'messiah of the poor'. He has also turned the PM into an acronym - "Modifier Of Developing India". He did not let this opportunity pass and sent out at least half a dozen tweets. Top lawmakers praise Modi ji... Says that the bilateral relations have entered a new phase. Finally, talking of absentees, there was one whose decision not to send out a single tweet on Modi's address is likely to upset the latter - the PM's 'friend' and President of the United States of America, Barack Obama. TWEET THIS Censor chief Nihalani admits he's proud to be PM Modi's chamcha. Will BJP CMs also confess now? PM Modi's address to the US Congress drew over-the-top praise from BJP CMs. Are they his chamchas? Listen in: Track list of Thalaiva Rajinikanth's Kabali is here! READ NEXT >> Listen in: Track list of Thalaiva Rajinikanth's Kabali is here!